Jen Berger '19 is a member of the Temple Law Class of 2019. Early in my 1L year, I heard that the Temple Women’s Law Caucus (WLC) formed in the early 1970s to build a coalition for advocacy focused on issues affecting the ability of women to succeed at Temple Law and in the legal field. The story goes that the Caucus’ first act of rebellion took place in Klein Hall. The women placed flower pots in the urinals of each men’s bathroom—a way of drawing attention to the fact that the law school had not been built with women’s restrooms. It was a small act, but a powerful statement. The organization’s origins and tradition of providing a forum to think about and confront obstacles facing women in the law led me to join the WLC. 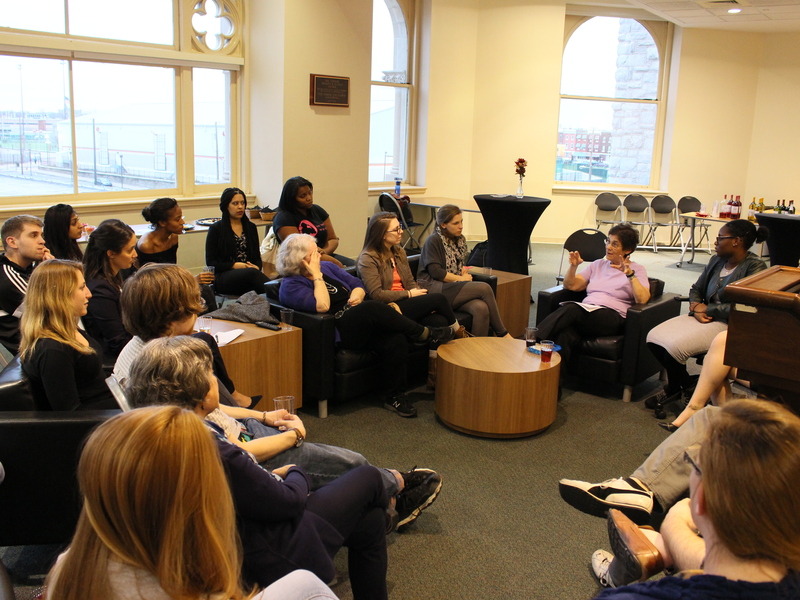 As old barriers that faced female Temple Law students were torn down, and women entered the law in greater numbers, the WLC came to emphasize networking for women seeking to climb the career ladder. Unfortunately, as news blasts about the toxic cultures at Uber and Fox News remind us, workplace discrimination, unequal pay, and sexual harassment remain persistent realities for women in every career on every rung of the ladder. While networking and advice-sharing may boost the careers of some, they won’t break down enough structural and institutional barriers for all. We need to address and champion progressive causes. The WLC hopes to take a stronger stance. As part of a transition towards making women’s rights the focal point of the organization, the WLC awarded its 2017 Distinguished Alumnus Award to Kathryn Kolbert, a self-described “rabble-rouser” whose talk on a rainy Thursday evening was a call to arms for Temple Law students. Ms. Kolbert has dedicated her career to ensuring that women have choices- in their careers, their family, and their healthcare. Before her current role as the Director of the Athena Center for Leadership Studies at Barnard College, Ms. Kolbert directed domestic litigation and public policy programs for the Center for Reproductive Law and Policy (which she co-founded). She served as the State Coordinating Counsel of the ACLU’s Reproductive Freedom Project in New York and as a Staff Attorney with both the Women’s Law Project and Community Legal Services here in Philadelphia. While networking and advice-sharing may boost the careers of some, they won’t break down enough structural and institutional barriers for all. If we hoped to hear about some of the summits of Ms. Kolbert’s career, we found ourselves disappointed. Only after her talk did I read in Jeffrey Toobin’s The Nine how Ms. Kolbert “devised one of the most audacious litigation tactics in Supreme Court history” in Planned Parenthood v. Casey. As the lead ACLU attorney representing Planned Parenthood, she crafted her petition for writ of certiorari to force the Supreme Court’s hand to hear a case that would either affirm or overturn Roe v. Wade before the 1992 presidential election. In accepting an award that honored her career and accomplishments, Ms. Kolbert declined to discuss her career and focused instead on prescriptions for law students who hope to sustain advances in progressive politics and a dissection of what went wrong in November. Ms. Kolbert pointed out what she saw as miscalculations by the Democratic party. She argued that Democrats lost sight of the adage that all politics is local. As Republicans strategized to win in politics at the local level, the GOP began to control state legislatures and statehouses. This control put the GOP in the position to redraw congressional districts and ensure a lasting Republican majority in the House of Representatives. The result, Ms. Kolbert argued, is that voters are forced to elect and re-elect legislators who follow party platforms and misrepresent the priorities of their constituents. And that goes for members on both sides of the aisle. Legislators have little incentive to find common ground with members of the other party. The Democrats failed to sense the lasting consequences of redistricting for their electoral success. They failed to make fair redistricting a priority so long as the status quo ensured safe seats for their party. Ms. Kolbert warned us that by refusing to reach out across the aisle, we lose out on potential allies and contribute to making our political opponents the “other.” She pointed out that in her own fight to protect the reproductive rights of women, she had at times found an unlikely ally in the Catholic Church. Though I didn’t agree completely with Ms. Kolbert’s theories on the Democratic party’s loss in November, particularly at the top of the ticket, I found her sense of energy restorative and her advice to start local reorienting. I appreciated her candor and balance of pragmatism with ideology. When a student asked that if, as Ms. Kolbert implied, sexism was a primary factor in Hillary Clinton’s loss, the Democrats ought to be pragmatic and only put male candidates at the top of the ticket, she gave a forceful “no.” In response to whether she’d struggled as a female attorney with some of the personal jabs she’d taken, she answered that she’d never cared about being liked. Seeing the continued resolve of a woman who has championed progressive causes, and reproductive rights–where for every step forward we seem to take several steps back– pushes me to turn my anxiety into motivation. Since the election, the professors and guest speakers at Temple Law have told us time and again that as law students now and members of the bar in the future, we are situated to set the direction of the law for decades to come. Ms. Kolbert’s talk maintained that lofty sentiment but helped to provide a more manageable focal point: start locally. Run for Ward Leader, take on pro bono work at your firm, or volunteer with the VITA clinic at the Sheller Center. And if you’re a woman entering the law, a thick skin may still prove to be helpful. Pictured above: Kathryn Kolbert LAW ’77 addresses members of the Women’s Law Caucus.